I posted about my work planner in August. Since then I purchased three planners and ended up in the original planner-The Plum Paper Teacher Planner in the large size. The planner is working out well for me. · Month on 2 pages: The boxes are big enough to write multiple things. There is also a couple of spaces to write events and birthdays. 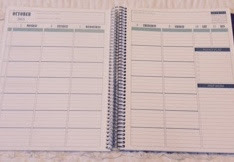 · Weekly Pages: Since I purchased the large size, there is plenty of room to write lists/tasks. Everyday is different, but I have room to write down meetings, appointments with students, tasks I need to work on and projects that I am currently working on. There is a never ending list and the space is perfect. · To do list: In the weekly pages there is a box for the week’s “To Dos.” I appreciate this because these are big items that I need to get done in the week. · Prep work: I don’t have “prep” work, but here is where I write projects that are coming up. This section reminds me what I need to be working on. Also, things that I know that won’t get done in the current week, go here so I know to get them done in the following week. · Size: I know that I said that I like the size so I can write down my never-ending lists. However, the planner is very bulky. If I stay with Plum Paper next year, I am going to get the regular planner. No more teacher planner for me. · I purchased the large teacher planner for space but also for the features that teacher’s usually use like class checklists. I was going to use the checklist to track specific tasks or meetings with students, but I track this on the computer in an excel sheet or Google form so this section is not being used. · To Do List: I do like this section, but I would prefer it to be a little longer. I have read on other blogs and seen Youtube videos about others using another type of planner called the Erin Condren Life Planner. 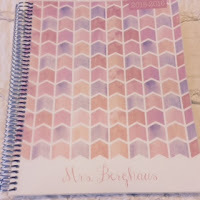 I use an Erin Condren life planner but I use it for personal use. Erin Condren came out with a horizontal version and I am thinking about using this version for work next year. If you do not know about Erin Condren, you should! Here is my link in case you are interested. Organization is crucial in my job as I imagine it is in many fields. Staying organized helps keep me sane. Whichever planner or planning system you use, please share. I am always interested in how others are planning and staying organized. Hi Everyone! My name is Christina and I am a school counselor at a high school in the East Los Angeles area in California. I enjoy helping students figure out their futures and believe that with hard work they can accomplish their goals. This blog is my avenue to share all things counseling. I want to share my adventures, highs, lows, and even some tools that have helped me out over the years. Balance: Book Review of Seraphina Does Everything!